A film director's personal journey experiencing his mother's disappearance into the Alzheimer disease, a film with essential Fridriksson's ingredients, humour, compassion and strong visual style. The story of a boyhood spent in Iceland in the 1960's. Tomas loves the movies and is highly influenced by them. Niceland is about a young man Jet, living a joyful life working at a factory with his girlfriend who he's deeply in love with. As a film lover I can't help immensely enjoying the meta film story this film is. This is the director's homage to his own late mother, which suffered from Alzheimer's disease. He's using his own Oscar nominated film from 1991, "Children Of Nature" as a backdraft for the story, which make us feel the move is a documentary, or at least a true story. Mama Gogo is starting off with an amazing meta experience, with a film maker presenting his film at a premiere, showing the view from great angles. The filmmaker after wards calls his older mother, starting to suffer from Alzheimer's decease losing control, but not do much that she isn't able to get out of trouble still. And this isn't the film makers only problem. The Islandic economy is on it's way to a crisis, and the film maker is experiencing that Icelandic people aren't too much into his movies. 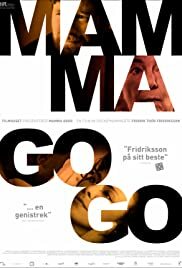 Mama is going into oblivion and does dangerous things, while the film maker, his wife and his sisters are going nuts being accused of stealing keys and jewels. This is a film has what I would consider fabulous production value. Beautifully filmed, with a lovely moving camera technique, following the action in a way I really like. The film is a comedy as well as being a meta film and a satire over the Icelandic financial crisis as well as over the Icelanduc film industry. I would classify this as satire with a serious depth. Kristbjørg Kjeld is brilliantly playing the mother, giving the impression she's everyone's own grandmother. She is stealing the screen as a smart and vibrant 80 year old woman, losing grip of realty. Sometimes so sweet and lovely, but accusing, deviant and diabolical the next. I would recommend this film for usage in schools or institutions teaching about elderly suffering from different stages of Alzheimer's decease. There's been several made, but this is by far the best, showing a wide range of symptoms from the decease,even the depressions and confusions following it, seen from both her and the family's stand. Another example of the great films coming from the Islandic movie industry, here in financial collaboration with Norway, Great Britain, Sweden and Germany. Friðrik Þór Friðriksson has made a heartwarming film though still funny and even so sad at times. This film was nominated the Icelandic candidate for the 83rd Academy Awards, but didn't make the final short list. It should have!